Unlock new opportunities through location to identify consumers and drive in-store traffic and sales. Location-based mobile advertising (LBA) uses native GPS-targeting technology to pinpoint exact consumer location at any given time. Our solution enables us to serve location-specific mobile advertising to the right person at the right place and time to drive in-store traffic and sales. Our LBA solution is a full stack mobile advertising platform from which we launch your ad campaigns. It supports all standard Interest-Based Advertising (IBA) ad units and its capabilities allow you to display dynamic ads based on a user’s location, proximity, and other data points. 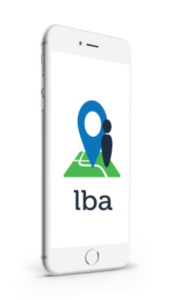 With LBA you have access to over 14,000 location-aware apps and sites, delivering 40+ billion monthly location verified impressions. By combining real-time user location (GPS) and location history, you can gain data about a consumer’s demographics and interests, which can then be used to serve relevant ads. Our LBA solution brings the time savings and wide reach benefits of a programmatic platform. Gain real-time bidding access to all major mobile ad exchanges and networks. By opening up this new channel, you will be able to capitalize on this trending growth area in digital advertising and, in turn, increase your revenue. Enables you to set a virtual perimeter for any real-world geographic area. Ads are delivered to consumers who enter the ‘fence’. Brands have the ability to target key consumers based on historical data. Retargeting can be customized to track visits to specific places, as well as categories of places. Base your marketing on real-world behavior trends to ensure you are reaching your target consumer accurately and efficiently. 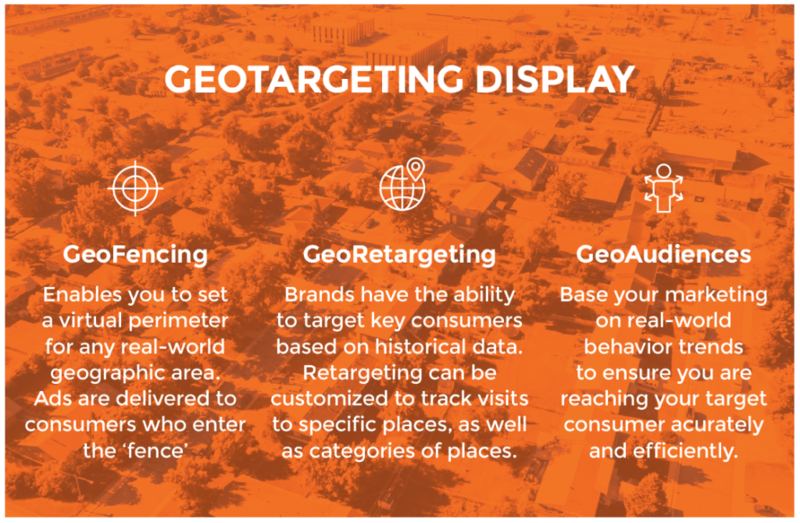 With access to hyper accurate Geo-Fencing, Geo-Retargeting and Geo-Audiences via billions of location-aware data points, our Geo-Targeting capabilities enable you to deepen your engagement with mobile consumers and serve the right ad to the right person at the right time and place. It’s a win-win: consumers see ads that are relevant and more engaging and advertisers can reach their true target audience to drive uplift in store traffic. Our technology provides a turnkey solution for local advertisers to target audiences of all sizes and in any area. We offer advertisers the leading location technology, premium inventory and Real-Time Bidding supply. Xcite is your location-based marketing expert. IP Targeting takes the traditional direct mail strategy and delivers a message in the form of banner or video ads on websites online. We can do this by taking a physical mailing address and matching it to an individual household, hotel, convention center, or public office building IP address. From there we deliver a variety of banner and display ads to the sites the targeted customer visits on the Internet. No cookies used. No cluster data. No district designations. 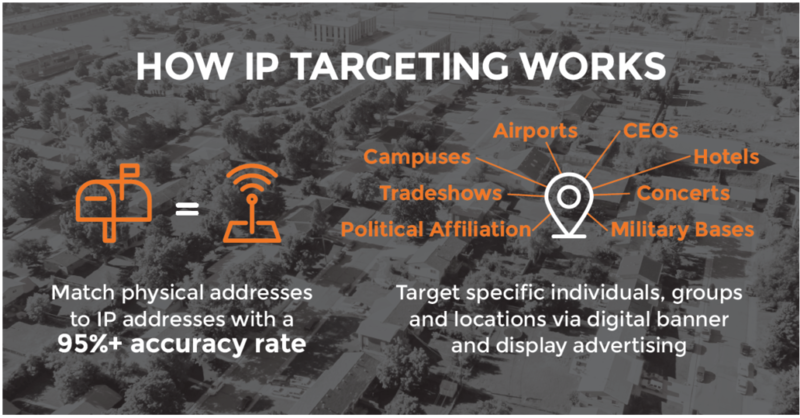 IP Targeting Examples: Advertising concerts or events to students on a college campus, or targeting Starbucks Wi-Fi cafes and offering customers “in-store” discounts on a bag of coffee beans. Audience Targeting – Target an audience 1:1 based on proprietary data intelligence. Campaign Exposure – Monitor store visits from the audience that was exposed to your campaign. Campaign Optimization – Identify organic store visits vs. campaign driven visits to help you account for seasonality and outliers. 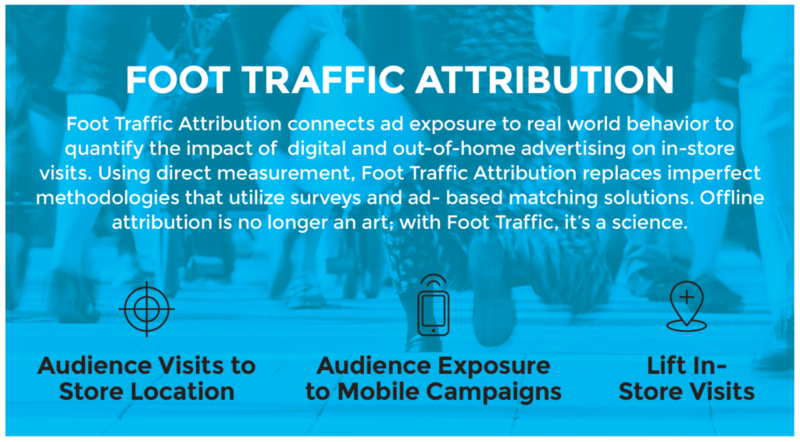 Foot Traffic Attribution – Measure visits, cost per visit and incremental lift in store visits to understand offline conversion directly attributed to your campaigns.